Depeche Model are an English electronic band that formed in 1980 in Basildon, Essex. The group consists of founders Dave Gahan (lead vocals, occasional songwriter since 2005), Martin Gore (guitar, keyboards, vocals, main songwriter since 1982), and Andy Fletcher (keyboards, bass guitar). Depeche Mode released their debut album Speak & Spell in 1981, bringing the band onto the British new wave scene. DEPECHE MODE T-Shirts which we offer at Plain-t-shirts.co.uk forms part of our movie, games and music official merchandise range. 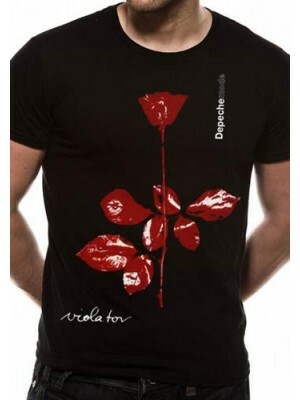 DEPECHE MODE range we offer fast delivery all over UK/EU DEPECHE MODE - VIOLATOR (UNISEX) which we offer which you can h.. Original band member Vince Clarke (keyboards, guitar, main songwriter from 1980 to 1981), left the band after the release of the album, leaving the band as a trio to record A Broken Frame, released the following year. Gore took over the lead songwriting duties and, later in 1982, Alan Wilder (keyboards, drums, bass guitar, occasional songwriter) officially joined the band to fill Clarke's spot, establishing a line up that would continue for the next 13 years. Depeche Mode have been a trio again since 1995, when Wilder left.